Isolated Island refers both to the first level of Chaotix Scenario Quest mode as well as four training levels accessible from the main menu. All Isolated Island levels are free of harmful obstacles and serve to familiarize the player with the game. On the Instruction Manual, this level is referred to as Practice Stage. 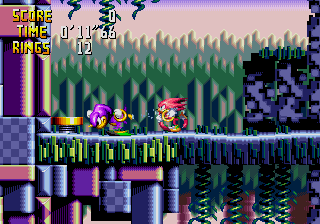 The Scenario Quest level, appropriately called "Introduction", reveals the game's "storyline", as Knuckles frees Espio from stasis with Ring Power as Robotnik escapes, and Metal Sonic hovers over the player. After this short scene, the player is placed into a training area, in which on-screen prompts guide the player through basic maneuvers. Upon satisfying the prompts or skipping them, the player is sent back to Isolated Island to clear the remainder of the level, to practice skills just learned, and to become acquainted with Chaotix's item repertoire. The palette changes to reflect changes in time of day as the player progresses. Finishing the stage with 50 rings does allow for Special Stage access, and the game will not let the player progress without entering the Special Stage if he/she can. The Training stages have the player trying to find a flower in each stage to light up. Most Training levels have one flower, although the third level has multiple. The stages are maze-like in design but hold no harmful obstacles.